(Bridgeport, Conn., June 17, 2017) – On Friday evening, the Bridgeport Bluefish welcomed their 4-millionth fan in franchise history into The Ballpark at Harbor Yard. Four-year-old Chase Kaldawy of Easton, CT was the lucky fan who walked through the turnstiles. Chase spun the turnstile during the top of the first inning. 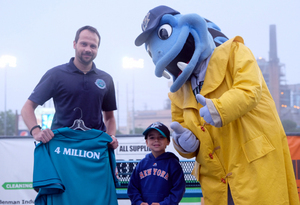 In addition to receiving a commemorative “4 Millionth Fan” official Bluefish jersey, Chase received a lifetime pass to any Bluefish game at The Ballpark at Harbor Yard, a Bluefish hat, a team-autographed baseball, an interview on the Bluefish broadcast during the game, a meet-and-greet with Manager Luis Rodriguez following the game, and the opportunity to throw out a ceremonial first pitch. Chase attended the game with his parents, Showky and Nikki, and his older brother, Camden.